Everyone owns playing cards. You may not think you do but dig around long enough in your house and you will generally find a pack somewhere. It seems to be an unwritten law, kind of similar to the way there is always a tin of peeled plum tomatoes and a jar of lentils in the cupboard even if you don’t remember ever buying them. But you know, that tattered old pack is probably a bit bland, it’s probably missing the 7 of clubs, the 3 of hearts and one of the jokers, it probably, in fact, needs replacing with anime playing cards! Quite a few anime series have playing cards based on them, but packs aren’t always that easy to come by. These Ghost in the Shell: Stand Alone Complex 2nd GIG ones were promotional items and so are rarer than most. The pack comes in a thin cardboard box like any cheap pack of cards and contains the usual four suits and two Jokers. 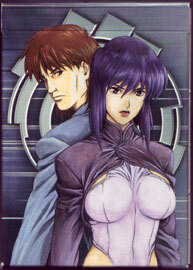 and are clear and easy to read, whilst the box itself carries a great sketch of Kusanagi and Togusa. As a pack of cards they’re fine but as licensed merchandise they are sadly a bit lacking. numbered cards, Kings and Queens feature pictures of Section 9 members, whilst the Jacks have pictures of Gohda and all but one Ace have pictures of Kuze. The biggest issue with the images is the fact that most of them are zoomed in, making them grainy and low quality which is unforgivable considering the visual quality of the series. There is also the annoyance that the cards slide across each other a bit too easily. Basically anyone who isn't a pro will probably find the cards spraying everywhere when shuffling, in fact simply picking them up caused the entire deck to slide straight out of my hands when I got them out for this review! I know they are promotional freebies but you expect better than such annoyances from something associated with Ghost in the Shell. If you are going to take the time to track these down you may be a bit disappointed. 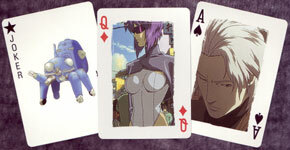 These Ghost in the Shell: Stand Alone Complex 2nd GIG playing cards are perfectly functional but there hasn’t been enough effort put into their design to make them as special as the series deserves. It’s good to see different images on each card, but the quality of each picture is generally pretty low and some more individuality for the deck as a whole wouldn't have gone amiss. Where's the futuristic writing or promotional artwork? As a pack of cards these are fine, but as anime collectibles they are not as good as they could have been. If you can find them for free they’re decent enough, but if you are looking to buy some there are better anime playing cards out there. Just the nice looking but flimsy cardboard box.